Custom designed for your precious Samsung Gear S2 SM-R720 / SM-R730 smart watch. NOT FIT Samsung Gear S2 Classic Watch (SM-R732 & SM-R735). For Samsung Gear S2 SM-R720 / SM-R730 smart watch ONLY. NOT FIT Samsung Gear S2 Classic Watch (SM-R732 & SM-R735). Fit 6.7"-10.2" (170mm-260mm) large wrist. 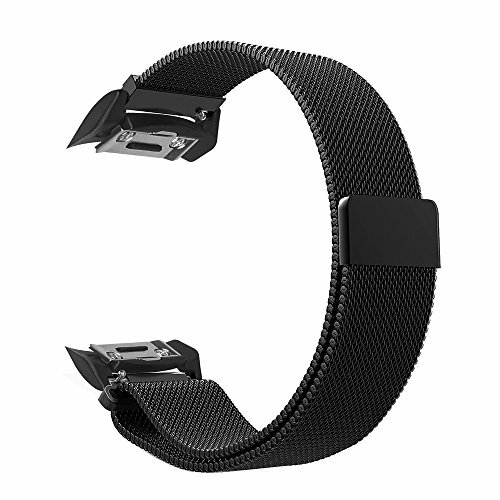 Unique and strong magnet clasp design, just adjust and stick to lock your watch band easily and securely. Crafted from top stainless steel mesh combined of fashion, nobility, durability and elegance. Superior and specialized woven technology, the smooth stainless steel mesh wraps fluidly around your wrist for comfortable day to day wear. Band comes with watch Lugs on both ends, which locks onto your Samsung Gear S2 smart watch securely & tightly, easy to assemble and remove, no tools needed.